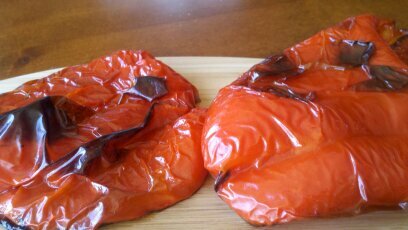 Much simpler than broiling whole peppers or holding them over an open flame, this method leaves peppers easier to seed and peel. 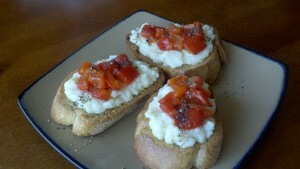 And I guarantee you’ll notice an even more intense roasted pepper flavor from the longer cooking time. Let cool, peel skin off gently. Cut into 1-2 inch strips. Store in olive oil for up to 3 weeks. 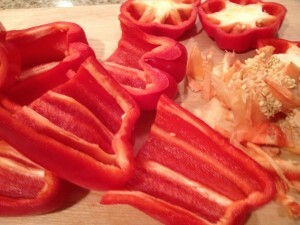 Pour off oil every few days and collect the delicious red pepper flavored oil. And as a key ingredient in finger licking good Greek ketchup . Store bought option – Our local Whole Foods market has them in the prepared foods section with the olives, capers etc but not all the time. 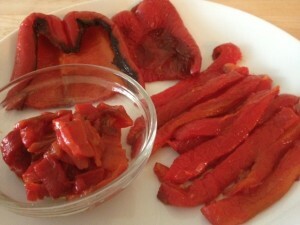 Pastene also makes jars of roasted red peppers with no preservatives or sugars. They are not terrible and can save you in a pinch. Remember to check and make sure jar options do not contain sugar or corn syrup or preservatives other than citric acid and salt.